Our names are Carolina Villarreal and David Molina, we come from Mexico. 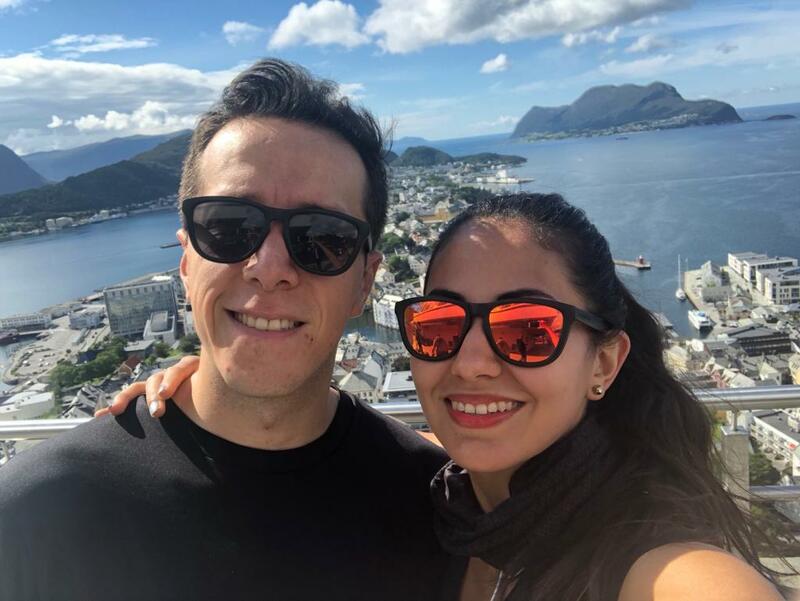 We have been a couple for more than four years by now, and two years ago we decided we wanted to study our master’s degree in NTNU in Norway. Carolina was working as a Design Engineer in a company, David had its own drone company and we were doing fine in Monterrey, Mexico. This is a story of bravery, fighting for what you want and taking big decisions boldly. We were supposed to apply in 2016 but we got passed the deadlines and we got sad because it meant that we would wait one whole year to apply again. So, we set up a plan and decided to apply in 2017 to start studying in August 2018. This time we planned in advance to have all the documents and tests necessary to fulfill the application. After a whole year, we applied on time and by March we were accepted to the master’s degree we wanted! This made us very happy and excited, but we also had a plan to apply for a scholarship from the Mexican Government. It was a very long application in order to obtain a payment for studying abroad. After months of gathering the documents and writing application letters, we applied to the scholarship. The problem was: The results were going to be made public on 27.07.18 and we had to be in Ålesund on 13.08.18…Such a small timespan to get everything ready! We got the results, and neither of us appeared in the scholarship list. We got very sad again for just a couple of minutes because we had worked very hard in order to achieve our plan. Without this scholarship, we had said that we would not come to Norway. After crying for those two minutes, we both realized that this was what we really wanted to do at that moment in our life. So, we made a decision none of our friends knew about. We had decided to go to Norway founded by our own means and savings. We told our parents about it and they said that they would approve if we got married. This talk was on 29.07.18, a Sunday evening. By Monday, we managed to call some of our friends to be our marriage witnesses and they were impressed because we told them “Hello I want you to be my marriage witness!”—and since they didn’t know anything, they were excited by the news of us getting married… but the biggest new was “…because we are going to go to Norway next week”. They were not expecting that and got very surprised. That same Monday, Carolina had to resign at her job within such a small timespan for notice, but they understood that it was a big opportunity for her. At the same time, David was selling his shares in his company. By Tuesday 31.07.18, Carolina and David got married just by signing the papers, and both our parents met each other that day. It was a small and simple celebration at Carolina’s home but very meaningful. During the next week, Carolina and David had to arrange everything. David had to leave his apartment and since he is from Toluca (southern part of Mexico), we had to travel first by car to leave his stuff and his car in his parents’ home. The last Saturday in Mexico, Carolina and David gathered all their friends and invited them to pizza and beers. Their friends didn’t know the reason of that invitation. They had been gathered to be told that in less than a week Carolina and David were going to be leaving Mexico to study in Norway. Their friends even called a Mariachi to sing them goodbye! The last Sunday in Mexico, Carolina’s mother organized a farewell reunion with Carolina’s family and grandparents. Carolina and David explained their motivation for leaving and her family was very happy to see them leave together. 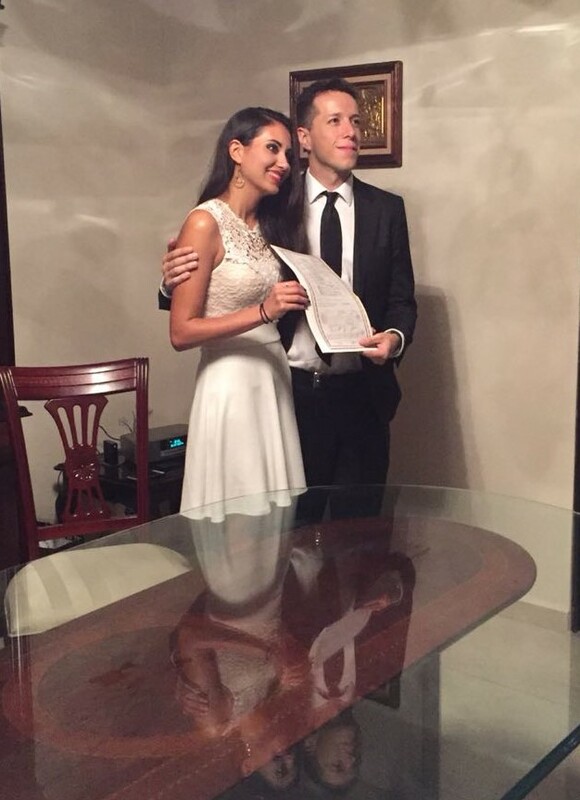 Carolina and David left Monterrey, the city where they had met, on 08.08.18 and they drove by car 900 km south. During this road trip there were a lot of problems, with several flat tires. It was a very long and dangerous drive. David and Carolina were splitting the drive time because they had not slept enough the previous days in order to get everything ready. When we arrived in Toluca at 10 pm, David’s parents had a dinner prepared for us and some friends visiting. After that we spent almost five hours getting all our stuff ready and we realized we would require an extra baggage to carry all our stuff properly at 3 am, less than 5 hours before leaving our country. 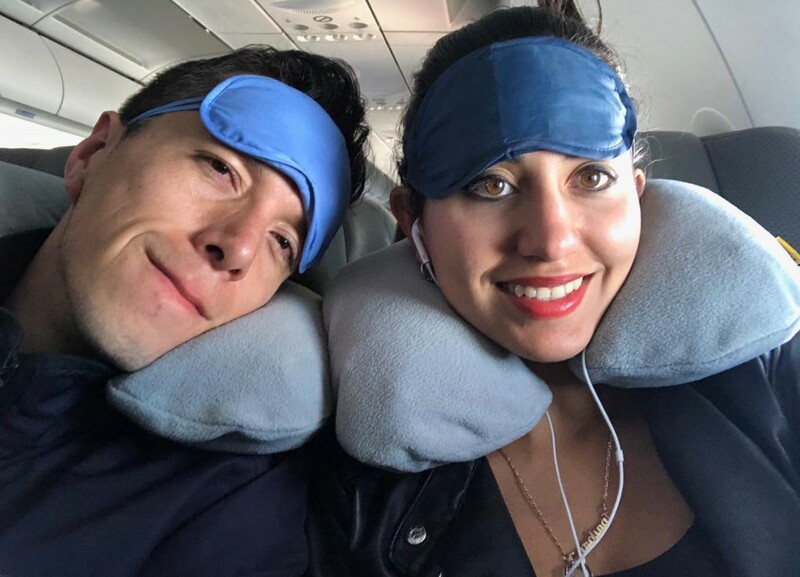 That day we slept 40 minutes, and then had to wake up very early (4:30 am) to take a bus to Ciudad de Mexico, and from there our plane travel would begin. Our first flight began on 09.08.18 at 7:30 am and it was from Ciudad de Mexico to Orlando, Florida. We had some free time there and were trouble keeping ourselves awake, because we hadn’t had a proper sleep for a few weeks. So, we took turns sleeping in these 8 hours of waiting time. After that waiting time, our plane to Oslo was delayed 6 hours more. This was something very intense for us, because we had to stay in the airport just waiting. After all those hours and some pizza slices, our plane was ready to go, and we slept almost all the 9 hours of the flight. After arriving to Oslo, our flight to Ålesund was delayed too, and we had to wait at least four hours more before flying again. We had a nice baguette at Oslo Airport and finally we took the last plane of our journey. We arrived in Ålesund on Saturday 11.08.18 at 2:30 am and we had to go for our Student House keys, so we got down from the Airport Bus in NTNU. It was amazing to be finally here! We got our keys and we walked to the Student House with our 4 x 20kg luggage, and once we got there, we slept almost 15 hours! After waking up, we went for a run in the Sunny Ålesund and it felt amazing to finally be here, together. After all the obstacles that we had had to overcome, we had finally made it! We both study the MSc. Product and System Design and we are very happy of having the opportunity of learning from great professors, meeting awesome new people and getting to know the charming Norwegian culture and landscapes that this beautiful country has to offer!